Many of us grow Phormium tenax or Phormium cookianum plants in our gardens. The coloured cultivars are almost ubiquitous now in many a planting scheme and have been arguably 'over-used'. Also, the big guys are notorious for being difficult to remove once they have grown to full size and need to be positioned carefully. But how many of us know the spiritual connections they hold for the Maori people of NZ or the amazing things that this tough evergreen can be used for? I have long used it in my coastal planting schemes but have grown to love and respect it for both its toughness but now for its spirituality too. (or should I say, sweet az) gallery at the top of the hippy-surf town of Raglan, North Island. My session began with a Kara kia - a prayer of thanks to Papatuanuke, the earth. Now in my time I have been to many workshops which begin with all sorts of introductions from the mildly embarassing to the deeply contrived. But there was something so seriously genuine about Ariane that I immediately found myself smiling in deep contentment and recognition at this wonderful approach to harvesting plant material. Ari told me that the plant material is never picked when it is raining, in the snow or at night. Women do not cut the flax when they are menstruating but they can weave. Weaving materials must be kept separate from the food areas and when working on it it is respectful to walk around the plant materials and not to step over them. 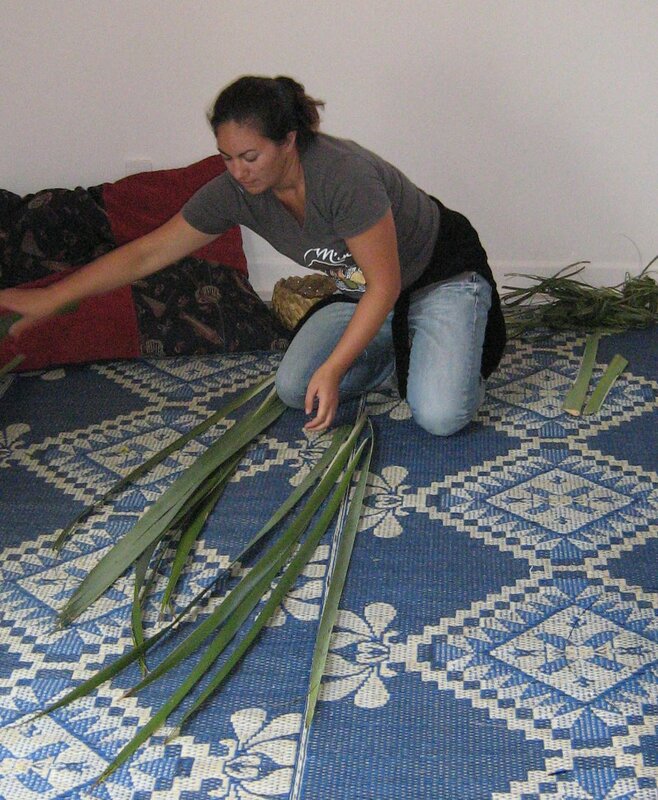 She had learnt her own weaving skills from a group of Maori mothers as part of a total immersion programme in one of the local schools. But she also explained that she had an uncle in her Maraii who was an especially good weaver and she had learnt a lot from him. 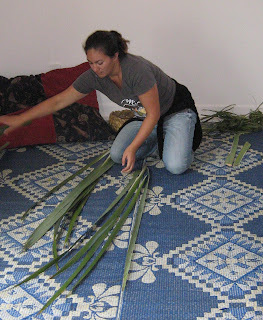 Clearly flax weaving was culturally very important to the Maori people. I was absolutely entranced by her simple combination of spirituality and good horticultural common sense. The story-telling approach to good practise resonated especially with me. As a trained primary school teacher I had often used this technique myself to aid with learning and the training of memory. The harvesting of the flax leaves involved choosing the best material and making a clean 45o clean cut with a stanley knife. The most important lesson was not to 'harm the infant', the emerging young bud guarded either side by the protective parents( the outer leaves) but to select older outer leaves instead. Thus of course, ensuring the continuing life of the plant. Tidying up as you go, rejecting the diseased or damaged leaves with any waste material going back into the compost bin for recycling was also explained to me. I nodded in approval and swopped some of my own tales of compost making back in England. I was loving this approach and we hadn't even begun to make a thing! Imagine if every child experienced just this simple giving thanks to the earth before harvesting a plant what a difference that would make to an understanding of the worlds resources. 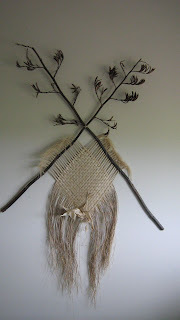 The flax, or Harakeke was great to work with. Strong yet supple, soft on the hands yet easy to tear. Whilst making my own humble weaving my eyes were drawn to other intricate weavings that adorned the walls. Particularly impressive was a contemporary ceremonial cloak which had feathers and embroidery woven into it. My own woven basket was quick to grow and I was as proud as an infant with its first emroidery sampler when I stepped out of the Studio some two hours later, clasping my green basket in my hands. The fact that I lovingly carried this back as hand luggage over thousands of miles and that it now sits amongst my personal treasures is enduring testimony to that special lesson. Hi Chris, what a great experience. I watched a documentary a while ago that showed flax weaving, and was amazed at the intricate creations, but it didn't touch on the spiritual side at all. Hi Chris, so wonderful your blog about Harakeke and its spiritual significance for Maori, It is such an amazing plant that certainly humbles me every time I weave. 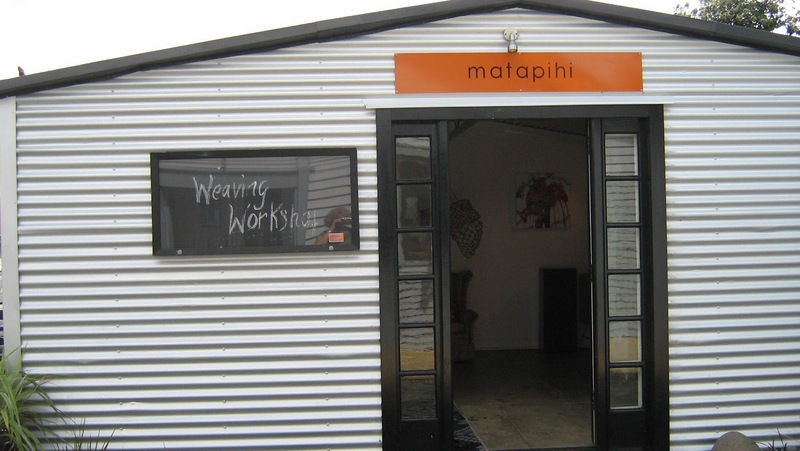 I so enjoyed reading the experience you had at Matapihi Art Gallery in Raglan. Ariana is not working with us anymore as she is studying Art full time. 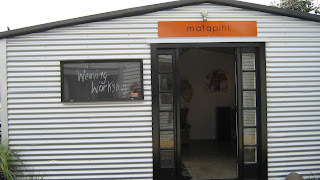 We are still offering weaving workshop's which are working really well. I will pass your email/info onto her. Thank you. Mihi nui na Ardre'Foote Matapihi Director. What a great article. Our students in Golden Bay have the advantage of learning from two expert flax weavers and they produce some wonderful things with all sorts of natural dies. I'm out with my year 12 Biolgy class on Monday investigating the Gause's Principle of Competitive Exclusion, using the notch and window caterpillars which live in the leaf base of the harakeke. Natural swimming pool? They invented that just before we left Switzerland. Using a reedbed to filter the water for swimming in. I think it is a wonderful compromise, if you swim.